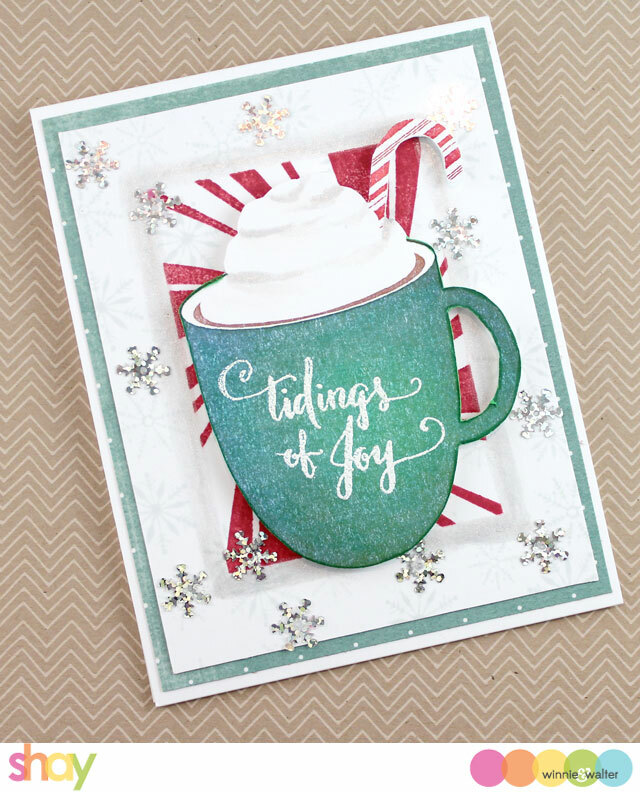 It's Shay here to share the happy news that we are sponsoring and participating in the Winter/Holiday Coffee Lovers Bloghop organized by our friends at Coffee Loving Cardmakers that runs from December 11 - December 18. This is a perfect time to get your coffee, tea and cocoa on as National Cocoa Day is December 13, 2015 and December 15, 2015 is International Tea Day! To find out more about joining in or just to enjoy the blog hop please CLICK HERE. There are tons of awesome sponsors and prizes! I am so glad I was able to participate in this hop! I made a card using a cocoa element from The Daily Grind Collection Vol. 1: Holiday Mint Add-On which happens to be freebie created a couple years ago in the very early days of Winnie & Walter. It is full of digital goodies that you can use not only digitally but also in hybrid (physical) projects. I really love this cup of cocoa Julie illustrated and it is so easy to use! I simply imported the cocoa image into a Word file and printed it out in color on white cardstock. I cut it out and colored in some shadows onto the yummy mound of whipped cream (got to love how much cream is in that cup!) to add some definition and depth. 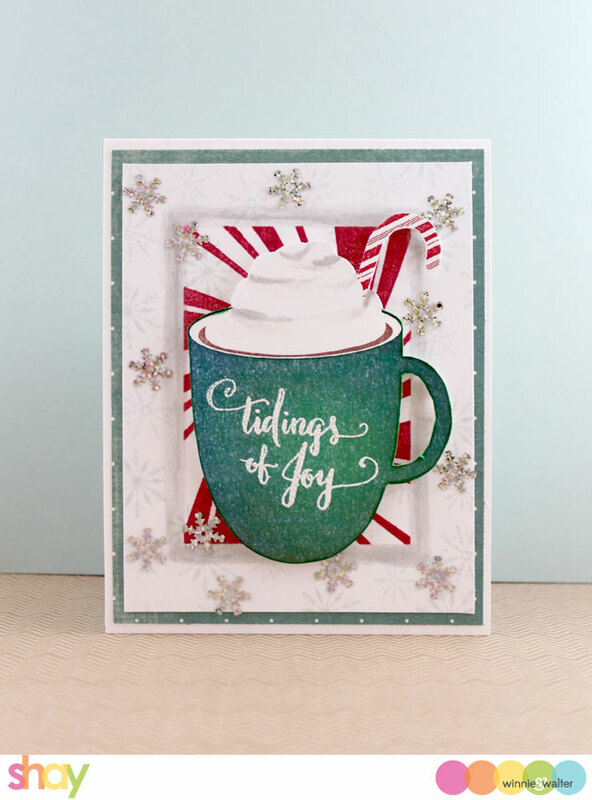 I stamped the sentiment from Merry & Bright with Evelin T Designs in Versamark and embossed it in white. On a panel of white cardstock I stamped the snowflakes from Merry & Bright with Evelin T Designs in grey. In the middle of the panel I stamped Mini Scenery: The Peppermint Zone in red to play up the sweet candy cane in the cup of cocoa. I added a border of grey around the peppermint rectangle. I adhered the snowflake panel to a piece of My Mind's Eye patterned paper which was adhered to a white A2 card base. On the snowflake panel I glued on some holographic snowflake sequins. Last I adhered the cup of cocoa using dimensional foam adhesive. I hope you have a wonderful weekend and have a chance to relax with a cuppa of your favorite warm beverage. Oh my...I ADORE this Shay!!! Very beautiful card Shay!! Love it!! Great card! Beautiful Christmas colors. Beautiful card, so festive! Thanks for being a Super Sponsor and Happy Holidays! Oh my this looks so delicious!! It's my favorite way to have a cup of cocoa in the winter time! :) Thanks for sharing! This is so cool! The peppermint paper behind it makes it look like a coffee cup out of a superhero comic book. All it needs is a cape! Soooo adorable! Thank you for being a sponsor of the hop! Snowflakes, candy canes and coffee...so comforting and cheerful. Thank you for sharing and being a super sponsor for the Holiday Coffee Blog Hop. This is so pretty! I love the sparkly snowflake background! And thank you so much for being a Super Sponsor! So pretty. Love the sparkly snowflakes. Thanks for being a sponsor. I LOVE all that sparkle! Thanks for being a super sponsor too! This is beautiful, Shay, love the sparkly snowflakes, peppermint, and your gorgeous cup!! Yummy cup of hot cocoa! Gorgeous card, Shay! I love how you paired your stamps and dies to create such a fun card! What a great card! Love everything about it! Yummy and festive!!! Love the little candy cane stirrer!! Love that cup of cocoa! Thanks for being a S S.
Love that color of the cup. Thanks for being a sponsor. This is fabulous!! I LOVE the coloring and the fun layering!! Love this creation of yours... the colors are great and love the gray snowflakes in the background with the sequins on top... cool! So beautiful !! LOVE the mug and the holographic snowflakes. Gorgeous! Your peppermint rectangle makes me want a cup of cocoa right now! Cool coffee creation and grey snowflakes are looking pretty! Thanks for being a super sponsor! Hermosa!!!! Es una verdadera cucada esa tarjeta. Abrazo!! really love this design with your digis. Thanks for being a sponsor! OMG! I love everything about your gorgeous card! Love the peppermint background behind that lovely cup, those colors are beautiful, and I love that sentiment! Thanks for being a Super Sponsor! Beauiful. I love that cup! beautiful! thanks for sponsoring the hop! yum! Love the candy cane and coordinating paper as a nice contrast. Wow, this is gorgeous!! Love the colors, the added snowflake sequins and the candy cane- thanks for being so generous to sponsor the blog hop!! Hugs and have a blessed week! So festive and fabulous! Love the way the mug really pops against the peppermint candy striped background!!! I am very much in love with the gorgeous coloring of that mug!! Thank you SO MUCH for sponsoring the hop! This looks cozy and yummy! I love it! What a stunning card and fabulous coffee mug image! It's a cold January day here and oh, how tempting that mug of cocoa looks! Inviting and yummy!